Do you need work outfit ideas, look at the one below and get inspired! this look is being rocked by my good friend Zoe. 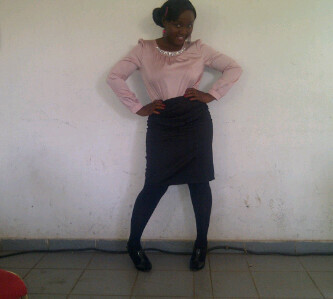 Cute but work friendly long sleeve dusty pink shirt, black pencil skirt, stockings, and black shoes. Simple, chick, sophisticated, and it suits her figure to a T. Do you have an interview, meeting, or business consultancy session coming up and you don't have what to wear? Why not raid your closet for your own version of this look and wear it this week? Naija CEOS - Stop searching for the purple squirrel!! The formula goes something like this: VACANT POSITION + JOB ADVERTISEMENT = HIRE THE PERFECT CANDIDATE… RIGHT???? Yet according to one HR thought-leader, seeking the so-called ‘perfect candidate’ is a trap fallen into far too often. Lance Haun, a former HR and recruiting pro turned author, says companies continue to throw money down the drain in the hunt for the perfect candidate for an open position. While the cost of hiring the wrong person can be cataclysmic, so too is the cost of spending months and months on the hunt, adding resources such as outside recruiters to the search to aid chances of securing Mr or Ms Right. Huan wrote in the Harvard Business Review this week that at the crux of this problem is the "purple squirrel" dilemma. It’s a term many in the business use to define those rare candidates that fit the job specifications so perfectly they’re almost mythical in nature. “These candidates are near-impossible to find in ultra-competitive industries and possess the perfect mix of skills, education and experience. A good purple squirrel will work for peanuts (also known as the pay and benefits you're willing to offer) and just happens to live in the same town as your company,” Huan said. But here’s the “wahala” Too often, those candidates simply do not exists. If the purple squirrel doesn't show, you've spent money and time on a fruitless endeavor. So what do you think CEOs, Business owners, and Managers, Is it time to re-think transferable skills and ditch the purple squirrel?